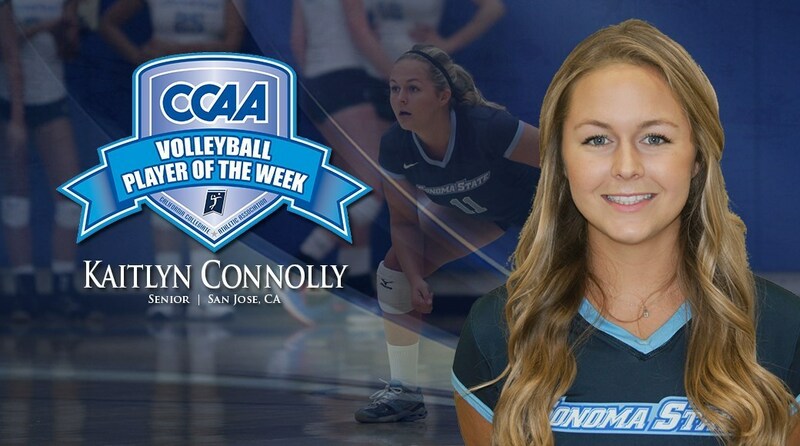 Sonoma State University senior Kaitlyn Connolly has been named the California Collegiate Athletic Association (CCAA) Volleyball Player of the Week for the week of Sept. 28-Oct. 4. Connolly was the backbone of SSU's stifling defensive effort in a perfect 3-0 week for the CCAA-leading Seawolves, which included two come-from-behind five-set victories over 20th-ranked Cal State San Bernardino and UC San Diego on back-to-back nights. Behind a double-double effort by Madelyn Densberger, who led all hitters with 11 kills and recorded 12 digs, the Sonoma State women's volleyball team cruised to its eighth consecutive victory with a dominating 3-0 win (25-18, 25-16, 25-16) over visiting Humboldt State on Oct. 10 at The Wolves' Den in Rohnert Park. The Sonoma State women's volleyball team swept Humboldt State in three sets in Arcata on Tuesday, Oct. 6 (25-20, 25-20, 25-16). Emily Papale scored a team-high 10 kills, followed by nine from Lexi Reddick. Kaitlyn Connolly recorded 21 digs and Kelsey McIntire, along with Reddick, made four assisted blocks each. The Sonoma State women's soccer team got two goals from Alex Sifuentes and one from Bella Amyx, Marissa Marable and Katie Mohr in the 5-0 victory over visiting UC Santa Cruz at the Seawolf Soccer Field in Rohnert Park on Friday, Oct. 9. The Seawolves, who are ranked at No. 12 in this week's NSCAA Division II Top 25 Coaches' Poll, secured their sixth straight win and their fourth straight shutout to improve to 8-1-2 this season. Sullivan Roche and Matt Weeber captured the Flight B Doubles title to highlight the Sonoma State men's tennis team's weekend at the Santa Rosa Junior College Fall Invitational on Oct. 11. Roche and Weeber won their quarterfinal match by default, and then grabbed an 8-5 win in the semis before taking an 8-3 victory in Sunday's final over Holy Names' Ivan Parra and Nikola Solaja. Senior midfielder Sean Callahan accounted for both goals in a much-needed win for Sonoma State over the Academy of Art at Fairmont Field in Pacifica on Oct. 9, defeating the Urban Knights 2-0 to improve to 6-4-2 overall and bolster their hopes for a postseason appearance. The Sonoma State men's soccer team gave up a goal midway through the second half and couldn't recover despite several chances late in Wednesday's 1-0 loss to visiting Notre Dame de Namur at the Seawolf Soccer Field in Rohnert Park on Oct. 7. Alexis Hayes entered Tuesday's final round as the tournament leader, but finished the tournament in a tie for fourth place with an overall score of 149 (+5). It would, however, lift the Sonoma State women's golf team to its best finish in 2015-16 thus far, placing second out of 13 teams on Oct. 6 at the Dixie State Invitational at Sand Hollow Golf Course in Hurricane, Utah. Maria Hurtado led the Sonoma State women's cross country team for the 10th straight meet, finishing 48th overall out of 230 runners with a six-kilometer time of 23:07 in the San Francisco State Invitational on Friday, Oct. 9 at Golden Gate Park in San Francisco. The Seawolves placed 17th out of 22 teams with a team score of 447.